Limited Inventory Special - Get an additional $1,950 off 5M, 5ML & 5MH Tractors or $2,600 off 5R Tractors on in stock units only. ¹0% purchase financing for 60 months on new John Deere Compact Utility Tractors. Down payment may be required. Representative Amount Financed ("RAF"): $50,000 at 0% APR/ACR, monthly payment is $833.33 for 60 months, total obligation is $50,000, credit charges/cost of borrowing based on RAF is $24. Monthly payments/credit charges/cost of borrowing will vary depending on amount borrowed/down payment. MSRP cash price is $48,217 based on highest priced product in series as of January 1, 2018 (includes delivery, freight, set up and a $50 documentation fee), plus taxes. Minimum finance amount may be required; representative amount does not guarantee offer applies. The charge for amounts past due is 24% per annum. Dealers free to set individual prices. Additional dealer fees may apply. Financing on approved John Deere Financial credit only. See dealer for details. May not be combined with other offers. Discounts or other incentives may be available for cash purchases. By selecting the purchase financing offer, consumers may be foregoing such discounts and incentives which may result in a higher effective interest rate. Get $590 off the agreed upon purchase price of a new John Deere 1 Family Sub-Compact Utility Tractor when two or more qualifying John Deere or Frontier implements are purchased at the same time. Get $355 off the agreed upon purchase price of a new John Deere 1023E or 1025R Sub-Compact Utility Tractor. Offer available 13 August 2018 through 15 October 2018. Get an additional $590 off the agreed upon purchase price of a new John Deere 1E or 1R Sub-Compact Utility Tractor. † Attachments and implements sold separately. Some conditions apply. See your participating dealer for details. Offer subject to availability and may be discontinued or modified. Taxes, setup, delivery, freight and preparation charges not included. ²0% purchase financing for 60 months on new John Deere Compact Utility Tractors. Down payment may be required. Representative Amount Financed ("RAF"): $50,000 at 0% APR/ACR, monthly payment is $833.33 for 60 months, total obligation is $50,000, credit charges/cost of borrowing based on RAF is $24. Monthly payments/credit charges/cost of borrowing will vary depending on amount borrowed/down payment. MSRP cash price is $48,217 based on highest priced product in series as of January 1, 2018 (includes delivery, freight, set up and a $50 documentation fee), plus taxes. Minimum finance amount may be required; representative amount does not guarantee offer applies. The charge for amounts past due is 24% per annum. Dealers free to set individual prices. Additional dealer fees may apply. Financing on approved John Deere Financial credit only. See dealer for details. May not be combined with other offers. Discounts or other incentives may be available for cash purchases. By selecting the purchase financing offer, consumers may be foregoing such discounts and incentives which may result in a higher effective interest rate. Get $590 off the agreed upon purchase price of a new John Deere 2R Series Compact Utility Tractor with the purchase of two or more qualifying John Deere or Frontier implements.Get $355; $1,770 off the agreed upon purchase price of a new John Deere 2025R; 2032R/2038R Compact Utility Tractor. †Attachments and implements sold separately. Some conditions apply. See your participating dealer for details. Offer subject to availability and may be discontinued or modified. Taxes, setup, delivery, freight and preparation charges not included. ³0% purchase financing for 60 months on new John Deere Compact Utility Tractors. Down payment may be required. Representative Amount Financed ("RAF"): $50,000 at 0% APR/ACR, monthly payment is $833.33 for 60 months, total obligation is $50,000, credit charges/cost of borrowing based on RAF is $24. Monthly payments/credit charges/cost of borrowing will vary depending on amount borrowed/down payment. MSRP cash price is $48,217 based on highest priced product in series as of January 1, 2018 (includes delivery, freight, set up and a $50 documentation fee), plus taxes. Minimum finance amount may be required; representative amount does not guarantee offer applies. The charge for amounts past due is 24% per annum. Dealers free to set individual prices. Additional dealer fees may apply. Financing on approved John Deere Financial credit only. See dealer for details. May not be combined with other offers. Discounts or other incentives may be available for cash purchases. By selecting the purchase financing offer, consumers may be foregoing such discounts and incentives which may result in a higher effective interest rate. Get $590 off the agreed upon purchase price of a new John Deere 3 Family Compact Utility Tractor when two or more qualifying John Deere or Frontier implements are purchased at the same time. 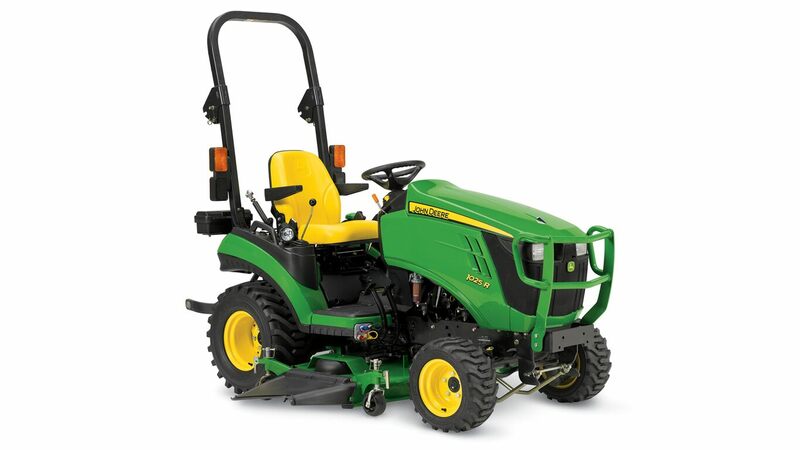 Get $885; $1,180 off the agreed upon purchase price of a new John Deere 3R Series; 3E Series Compact Utility Tractor. Offer available 13 August 2018 through 15 October 2018. Get an additional $945 off the agreed upon purchase price of a new John Deere 3E Compact Utility Tractor. † Attachments and implements sold separately. Some conditions apply. See your participating dealer for details. Offer subject to availability and may be discontinued or modified. Taxes, setup, delivery, freight and preparation charges not included. 4 0% purchase financing for 60 months on new John Deere Compact Utility Tractors. Down payment may be required. Representative Amount Financed ("RAF"): $50,000 at 0% APR/ACR, monthly payment is $833.33 for 60 months, total obligation is $50,000, credit charges/cost of borrowing based on RAF is $24. Monthly payments/credit charges/cost of borrowing will vary depending on amount borrowed/down payment. MSRP cash price is $48,217 based on highest priced product in series as of January 1, 2018 (includes delivery, freight, set up and a $50 documentation fee), plus taxes. Minimum finance amount may be required; representative amount does not guarantee offer applies. The charge for amounts past due is 24% per annum. Dealers free to set individual prices. Additional dealer fees may apply. Financing on approved John Deere Financial credit only. See dealer for details. May not be combined with other offers. Discounts or other incentives may be available for cash purchases. By selecting the purchase financing offer, consumers may be foregoing such discounts and incentives which may result in a higher effective interest rate. Get $590 off the agreed upon purchase price of a new John 4 Family Deere Compact Utility Tractor with the purchase of two or more qualifying John Deere or Frontier implements. Get $2,360; $4,720; $1,180 off the agreed upon purchase price of a new John Deere 4044M/4052M; 4066M; 4044R Compact Utility Tractor. †Attachments and implements sold separately. Some conditions apply. See your participating dealer for details. Offer subject to availability and may be discontinued or modified. Taxes, setup, delivery, freight and preparation charges not included. 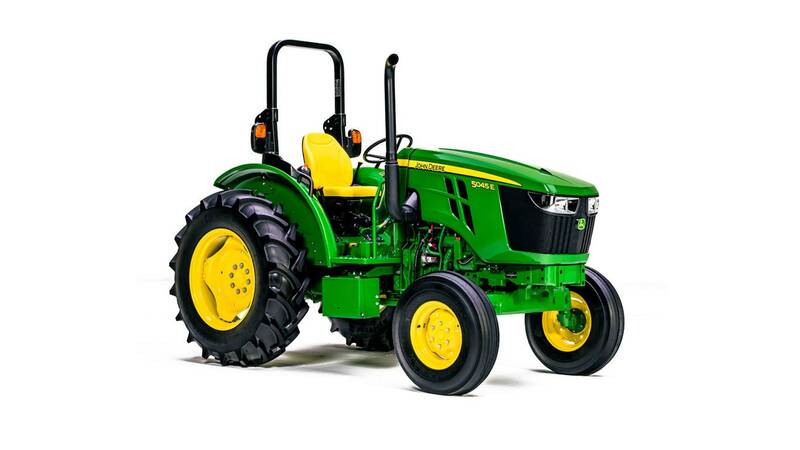 5 0% purchase financing for 4 years on new John Deere 5M/5R Series Utility Tractors. Down payment may be required. Representative Amount Financed ("RAF"): $100,000 at 0% APR/ACR, semi-annual payment is $12,500 for 4 years, total obligation is $100,000, credit charges/cost of borrowing based on RAF is $24. Semi-annual payments/credit charges/cost of borrowing will vary depending on amount borrowed/down payment. MSRP cash price is $122,481 based on highest priced product in series as of January 1, 2018 (includes delivery, freight, set up and a $50 documentation fee), plus taxes. Minimum finance amount may be required; representative amount does not guarantee offer applies. The charge for amounts past due is 24% per annum. Dealers free to set individual prices. Additional dealer fees may apply. Financing on approved John Deere Financial credit only. See dealer for details. May not be combined with other offers. Discounts or other incentives may be available for cash purchases. By selecting the purchase financing offer, consumers may be foregoing such discounts and incentives which may result in a higher effective interest rate. 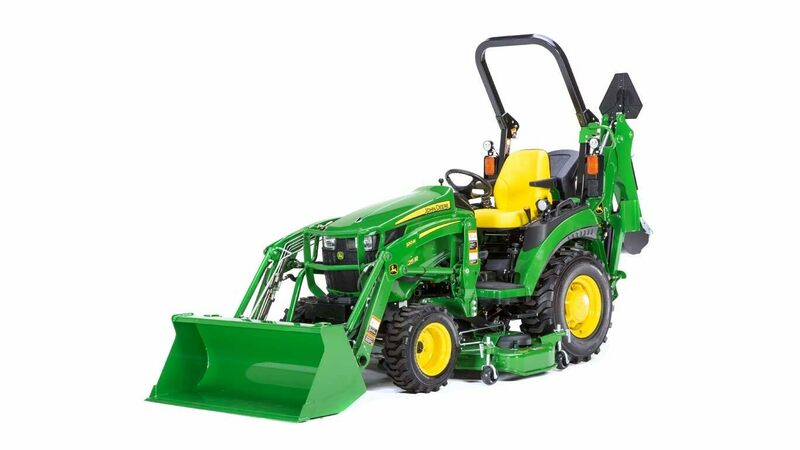 Get an additional $1,950 off the agreed purchase price of a new in stock John Deere 5M, 5ML, 5MH Series Utility Tractor. 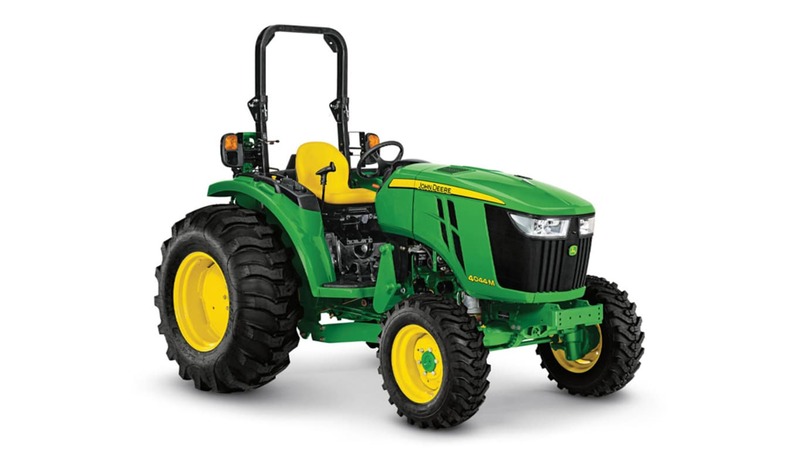 Get an additional $2,600 off the agreed purchase price of a new in stock John Deere 5R Series Utility Tractor. Dealer stock models only. Limited inventory per dealer. While supplies last. Attachments and implements sold separately. Some conditions may apply. See your participating dealer for details. Offer subject to availability and may be discontinued or modified. Taxes, set-up, delivery, freight and preparation charges not included.